Just finished another in my aviation series. This is one of my smaller paintings, 16X20″, acrylic on canvas. This is a scene of the FW190 making a low pass over a destroyed city. Note the drifting smoke on the lower left, also the T34 Russian tank, lower right. In the distant foreground are barrage balloons, a common sight in WWII. Above center is a formation of German bombers. All comments are welcome. Update: I am putting together a CD of my paintings and submitting to MONCA* for consideration of a display. Also have one prospect for a showing in January. More to follow. 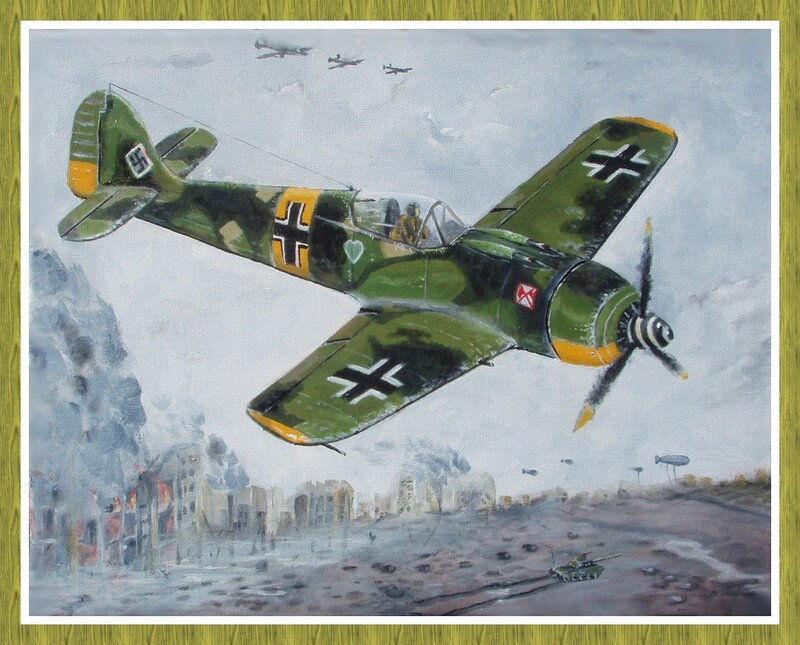 This entry was posted in Art and tagged 2017, acrylic on canvas, Jack Lee Art, Lee's FW190. Bookmark the permalink. I have a copy of my grandfather’s discharge from the U.S. Army Air Service as a 2Lt from Camp Dix February 23, 1919. My own discharge is dated 16 February, 1977 from Fort Dix.